We had lunch at Happy Buddha Vietnamese Vegetarian Restaurant in Barrington this week and look forward to a return visit. This tiny diner shares a building with a computer repair business. Look for the McDonald’s next door as a landmark. Happy Buddha opened 7 months ago as a vegetarian only restaurant. Many patrons requested items with meat and a non-vegetarian section was added to the menu. 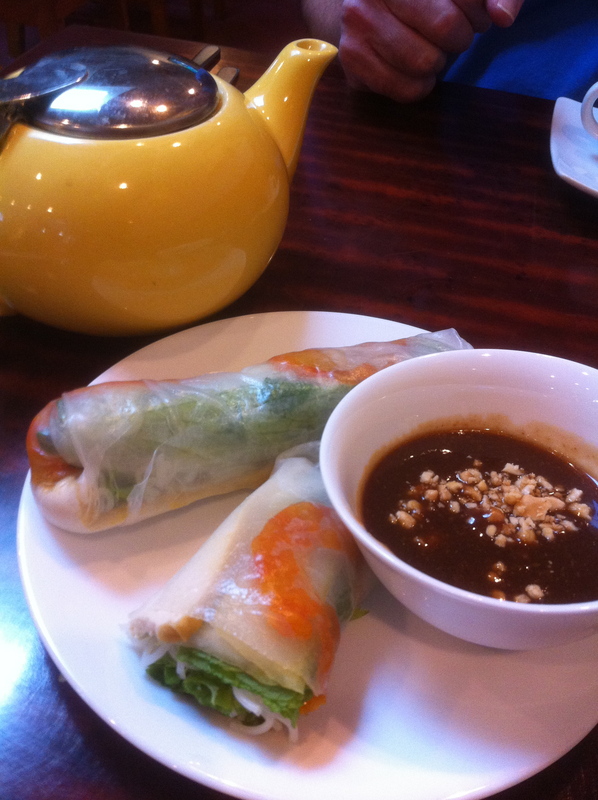 We started our meal with a pot of green tea and vegetarian spring rolls filled with soy shrimp, tofu, bean sprouts, mint, lettuce and rice vermicelli noodles wrapped in rice paper. A dish of peanut dipping sauce came on the side. These were a delicious blend of crunch and smoothness. The lunch menu includes many choices reasonably priced at $6.95. 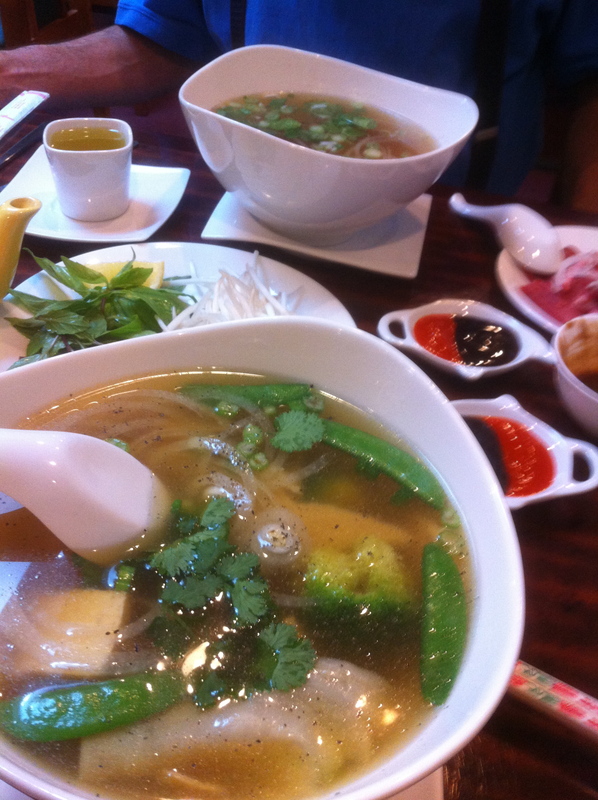 We both chose pho from the regular menu, a broth with rice noodles and vegetables served with bean sprouts, bay leaves and lemon to add yourself. I had the vegetarian version while my partner had the beef version. I also tried the avocado shake which I highly recommend. The generous serving was so thick it towered over the top of the glass. While we usually thick of avocado as an ingredient in Mexican foods and salads, my son has used them as an ingredient in his smoothies for several years. Happy Buddha is alcohol free. Two Vietnamese sisters run the restaurant and be aware of possible language barriers. Be patient as the confirm your order with you. Service was attentive on our visit. If you have a party of six or more, they request you call in advance.